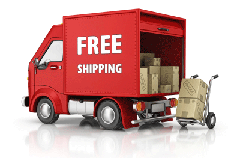 The Canada Seat Skins Company Inc. will delivery your custom upholstery package anywhere in Canada free of charge. This means no duty, no brokerage and no hidden fees. This is our guarantee to you and why we offer the lowest landed cost on custom leather interiors anywhere in North America. Shipping any item across the border can result in very expensive brokerage, duty and conveyancing charges that are passed to the unsuspecting customer on delivery. The Canada Seat Skins Company Inc ships Canadian orders from within Canada and American orders directly from our outlet in the USA. This guarantees the lowest delivered prices with no hidden fees or cross border brokerage. We understand rural Canada and why using Fedex or UPS is not a viable option. Need more ? We bill you in your home currency (usd or cdn) so you do not pay the 4.0 - 5.0 % credit card exchange rate penalty or even higher Paypal exchange rate penalty. Canada Post Express delivery to rural routes. Canada Post Express delivery to rural PO boxes. Free Signature confirmation on every interior order. Free Insurance coverage on every interior order. No brokerage, no duty, no fees, no BS on delivery. Just sign and go. No packages left unattended at your door. No taking time off work to try to meet your shipment. Convenient local pick up at locations all across Canada. Canada Post will hold your package up to 2 weeks (3 weeks with notice). We can hold interiors for fly in, fly out customers and arrange delivery for your return. Please note that rush shipments require address pre approval and someone must be available during business hours to take delivery. There is no charge for this service. Please call to discuss this option with your customer service representitive. We are very please to announce our expansion of the free shipping policy to include all areas of Canada both rural and urban. The list below can now be used to reference the larger cities which offer the fastest delivery times. If you live in a more rural or norther community such as listed below, delivery is still free however delivery times will be increased by a few days.